One wonders if it’s an accident that a year after half the Baton Rouge area flooded, with little to no help from the government, that victims of last August’s flood have just given up and aren’t signing up for assistance. Because that’s where we are. With tens of thousands of Louisiana homes damaged by floodwaters last year, you might expect a mad dash from homeowners scrambling to seek the $1.3 billion in federal recovery aid available for repairs and rebuilding. Instead, state officials still are trying to persuade people to sign up across the 51 parishes damaged by the March and August 2016 floods now that Congress has provided the cash, and that’s going to make it harder to pressure Washington for another round of recovery dollars. Louisiana’s flood rebuilding program is emailing, sending text messages, running ads, hosting outreach events and even going door-to-door to try to track down homeowners who might be eligible for aid, along with locating those who could stand to receive assistance if the state gets more federal money. “We still have thousands of homeowners out there who we know are eligible for assistance and the funds are now available, but we do need them to sign up,” Edwards said, standing outside a home repaired through the state’s Restore Louisiana program. This is one reason why Baton Rouge’s congressman Garret Graves spent more than six months beating on John Bel Edwards for the slow pace of his flood response. We’re a year on and people have given up getting any assistance from the government. They’re no longer interested in filling out Edwards’ flood survey; they made other arrangements to fix up their houses and they’re not interested anymore. More than 36,000 people have filled out the survey since it went online in April. About 21,000 are expected to be eligible for the available aid, short of the people expected to qualify and only a fraction of the 112,000 homes estimated to have been damaged by the floods. Forbes listed an array of roadblocks in getting people to take the survey. Some homeowners assume Louisiana will run out of money before getting to them. Some incorrectly think only low-income homeowners are eligible. Others believe they can’t get a dime because they finished rebuilding. People don’t trust government programs. Some see an advertisement and think it’s a scam. And some simply haven’t heard about the aid. “I continue to be surprised that there are people who say they didn’t know the program existed. It’s hard for me to imagine that scenario, but it’s out there,” Forbes said. Pat Forbes is Edwards’ disaster recovery chief and by all accounts he’s not bad at his job, but this is a perfect example of why government simply doesn’t work in the real world. Graves was screaming back in September that Edwards needed to hire a program manager to do exactly what one ended up doing in April when it was too late. Edwards sat on his hands and treated the criticism as partisan politics, then proceeded to demonize Graves as a liar. Now, most – or at least a sizable amount – of that $1.3 billion will go unused because the people who needed it have given up on it. And that will mean it’s a lot harder to get flood recovery cash from the federal government in the future. Which is good, in a way, because a repeat of the profligate waste of the Katrina recovery shouldn’t happen. 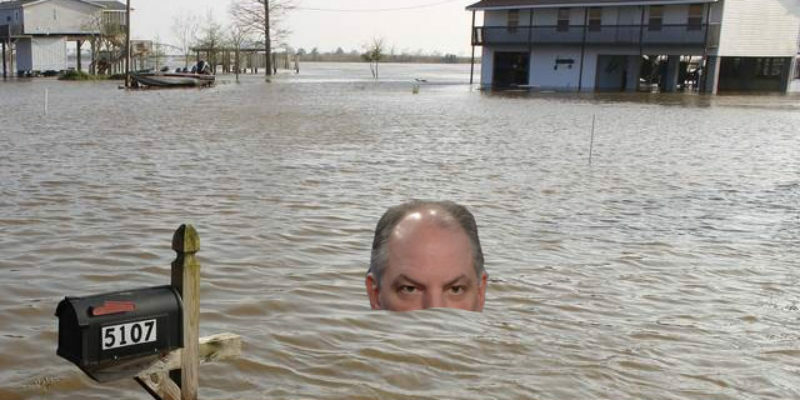 But the thing to watch for now, since individual homeowners have moved on, is Edwards and his gang slathering flood recovery dollars on local governments who don’t really need them. In short, this is a shambles. It’s a Charlie Foxtrot. John Bel Edwards is a scaled-down Kathleen Blanco. Oh, by the way – don’t be too shocked to find out later that a number of flooded homeowners in North Baton Rouge have just thrown in the towel and not bothered to rebuild, free government money or not. If your neighborhood has gone to the criminals, it’s easy to just let that flooded house be the bank’s problem and go rent an apartment in a better area. That’s something which flood recovery dollars might not be able to fix.